The CellModeManager provides a Qt Extended Server Task. Qt Extended Server Tasks are documented in full in the QtopiaServerApplication class documentation. 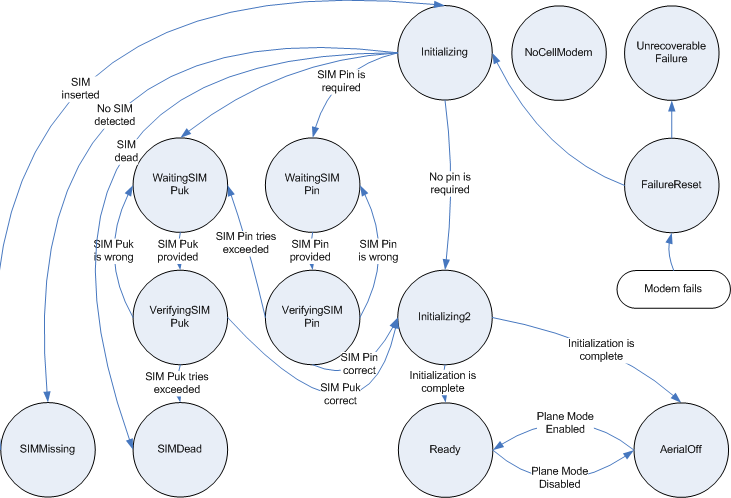 The CellModemManager class provides a simplified goal-oriented wrapper around the Telephony APIs. While the telephony subsystem provides the ability to query and control every aspect of a cellular modem, the CellModemManager class focuses only the task of initializing the telephony subsystem and monitoring common attributes such as the current operator or cell location. /Telephony/Status/PlaneModeAvailable True if the modem supports "plane mode". Possible values are "Yes", "No" or "Unknown". The "Unknown" value is set during modem initialization before Qt Extended has determined whether the modem can support plane mode. CellModemManager::UnrecoverableFailure 12 The modem has failed in such a way that it cannot be recovered. Qt Extended or the device will need to be restarted.